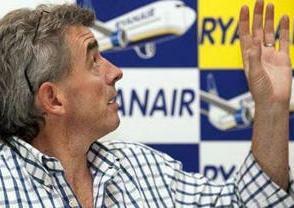 September 5, 2010 - Ryanair, Ireland’s low-cost airline, Chief Executive Officer Michael O'Leary was recently interviewed by Bloomberg Businessweek, in which O'Leary made comments which bring into question his ability to operate the air carrier safely and his ability to intellectually be a critical thinker when it comes to the safe operations of their flights. The Joint Aviation Authorities (JAA), a multi-national organization that oversees the common safety and regulatory standards has set aviation requirements for commercial air transportation and one of their requirements under "Accident prevention and flight safety program" requires that operator shall establish and maintain an accident prevention and flight safety program. Ring a rings the bell during an emergency would not be acceptable under current regulations. Aviation safety experts, airline pilot and flight attendant unions and consumer groups now question O'Leary's ability to oversee the airline safely. Jim McAuslan, the general secretary of the British Airline Pilots’ Association said, “Are there no lengths to which he will not go to get publicity? His suggestion is unwise.” Kate Hanni, the founder of FlyersRights stated, “He insults the dignity of the flying public every time he opens his mouth.” Perhaps O'Leary should become familiar with current regulations on crew member requirements (JAR-OPS 1: Commercial Air Transportation -Airplanes).